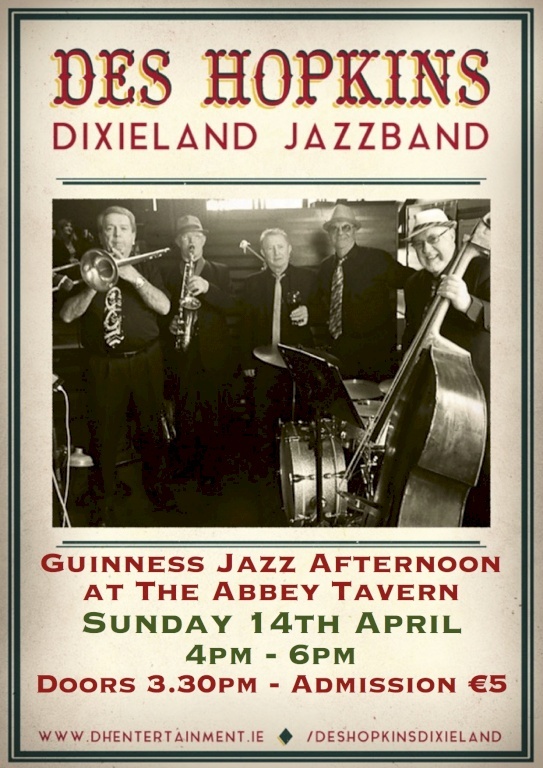 Join us at 4pm on Sunday 14th April for Afternoon Jazz & Swing Dance with Des Hopkins's Dixieland Jazz Band. This great band has toured all the major jazz festivals of Europe. The band is in constant demand for festivals and corporate entertainment. This ultra-professional Dixieland Jazzband, led by the legendary jazz drummer Des Hopkins, features top musicians playing and singing the great music of the twenties, thirties, and forties, and all the hits of ‘The Jazz Age’ presenting an amazing and entertaining performance. Des Hopkins and his band appeared on every Cork Guinness Jazz Festival for over 30 years, always one of the main and most popular attractions, proving through the years, their immense popularity for quality music and entertainment. They return for The October Bank Holiday Weekend with six concerts at The Clayton Hotel Cork City.